PLEASE NOTE: With all of the brakes offered, these do not fit all of the rims on the market. While we attempt to give you a "rule of thumb" on the kits listed below, we are not responsible for the fitment with your exact set-up. Please use wheel charts provided for maximum efficiency when choosing a brake kit below. This system features the 6S 6-piston Monoblock caliper mounted to a 15" 2 piece slot, drill, zinc plated rotor. Baer systems include stainless steel brake hoses as well as calipers that have D.O.T compliant dust and weather seals. The 6S and 6R (R-Spec) calipers are Baer's Flagship offering, and are built out of a single piece of US sourced 2618 forged aluminum. • Uses the common D1247 (DR11) race pad backing plate, that is shared by many other competition calipers. 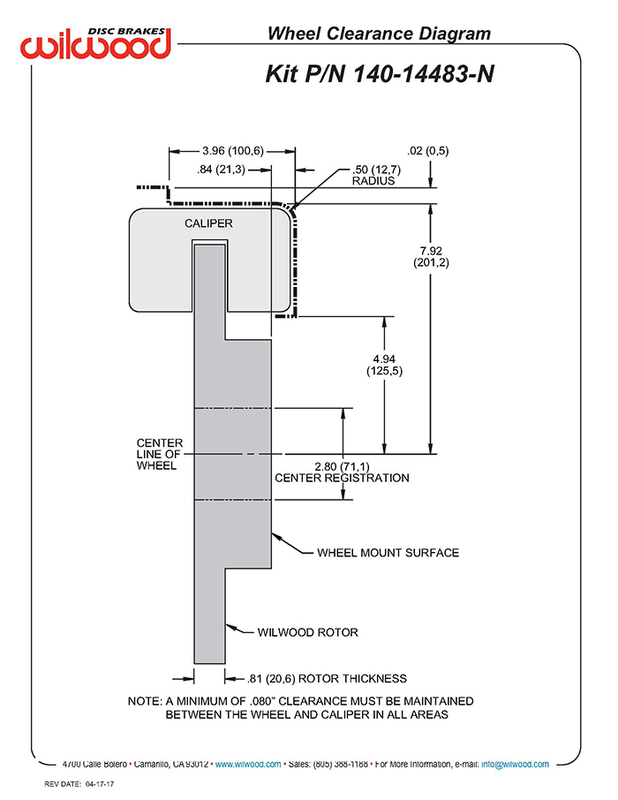 • Caliper can accept 13.5” to 16” rotors. BAE-4262692 2015-2019 Mustang® Baer Extreme Plus Front 15" Big Brake Kit with 6 Piston 6S Monoblock Aluminum Calipers Min 19" Wheels Required Wheel Diagram and Instructions Picture is not actual product. 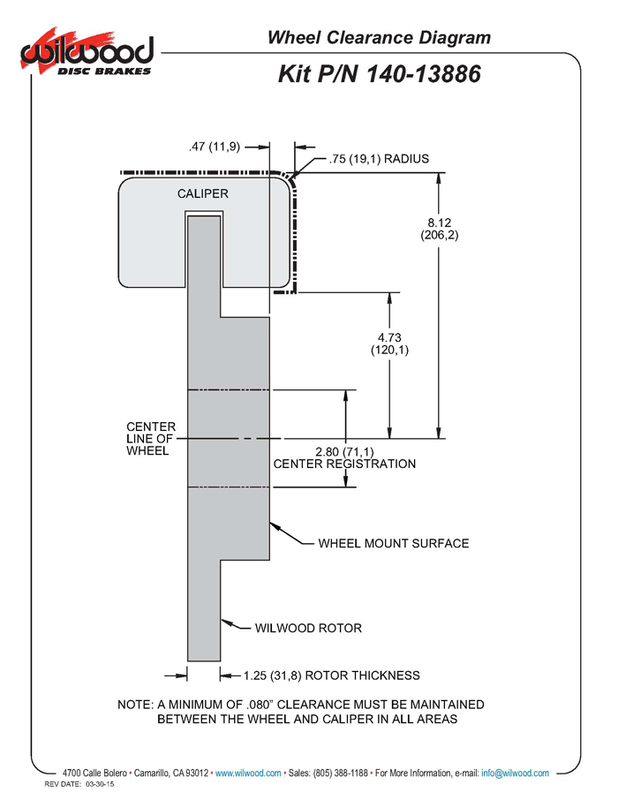 WIL-FBK-2015A 2015-2019 Mustang® Wilwood Aero6 Front 15" Big Brake Kit with 6 Piston Aluminum Calipers Min 19" Wheels Required Wheel Diagram and Instructions AERO6 calipers were designed for the specific purpose of providing big capacity braking with large diameter rotors for heavy weight and extreme duty vehicles. For cars, it’s the biggest of the big providing big brake performance for show and dual purpose street and track vehicles. For trucks and SUV’s, it provides big stopping power for towing, off-road, and enhanced braking with wheel and tire upgrades. Kits listed for specific vehicles are fully compatible with OE master cylinder output and ABS function. Directional staggered vane 14.00” to 15.00”rotors provide maximum cooling for sustained high heat durability. WIL-FBK-2015B 2015-2019 Mustang® Wilwood Aero6 Front 14" Big Brake Kit with 6 Piston Aluminum Calipers Min 18 Wheels Required, Wheel Diagram and Instructions AERO6 calipers were designed for the specific purpose of providing big capacity braking with large diameter rotors for heavy weight and extreme duty vehicles. For cars, it’s the biggest of the big providing big brake performance for show and dual purpose street and track vehicles. For trucks and SUV’s, it provides big stopping power for towing, off-road, and enhanced braking with wheel and tire upgrades. Kits listed for specific vehicles are fully compatible with OE master cylinder output and ABS function. Directional staggered vane 14.00” to 15.00”rotors provide maximum cooling for sustained high heat durability. WIL-140-14482-N 2015-2019 Mustang® Wilwood Dynapro Front 14" Road Racing Brake Kit with Aero6 Piston Aluminum Calipers Nickel Finish and Slotted Rotors Min 18" Wheels Required Wheel Diagram and Instructions AERO6/QS-ST six piston radial mount calipers are coupled with the high cooling capacity of 14.00” dynamically mounted GT directional vane rotors to provide the ultimate brake package for unrestricted road race competition. Thermlock pistons in the calipers resist fade and extend service life by reducing the heat transfer from the pads, caliper body, fluid, and seals. New design AERO6/QS-ST (Thick Pad) calipers with 20mm thick pads increase endurance with longer pad life. Rotors mount to the hubs with forged aluminum hats and radial mount brackets secure the caliper to the spindle in the OE location without modification. Kits also include high temperature, high friction race compound pads and all premium grade fasteners. WIL-140-14100-D 2015-2019 Mustang® Wilwood Dynapro Front 12.9" Drag Racing Brake Kit with 4 Piston Aluminum Calipers Slotted and Drilled .35" Rotor Min 17 Wheels Required, Wheel Diagram and Instructions DynaPro4R Drag Race front brake kits deliver high torque stopping power with a substantial weight savings over the OE brake components. Dynamic mount steel rotors weigh only 5.7 pounds each. They attach to the OE hubs with lightweight forged aluminum hats using our T-nut mounting system that allows the rotor to move independently of the hat during heat cycles. 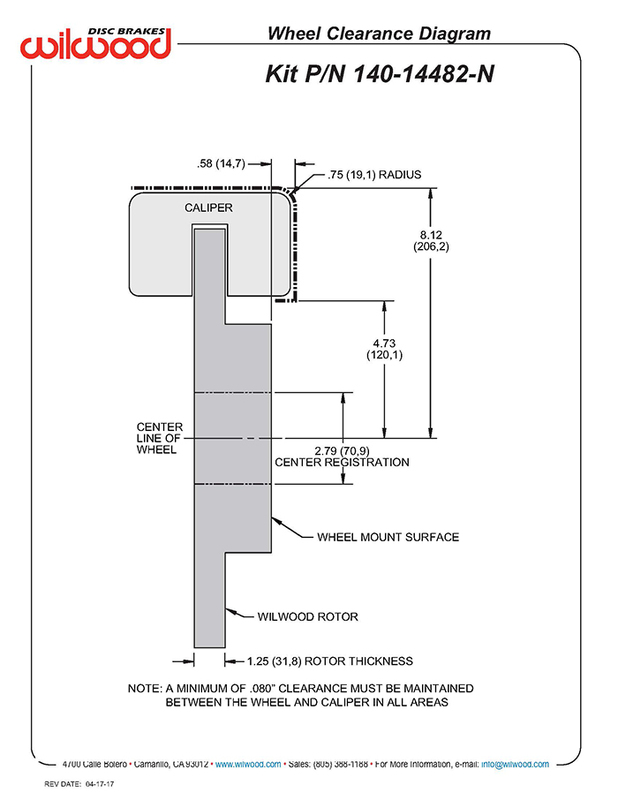 This eliminates stress at the mount points and the subsequent rotor distortion that can otherwise occur with fixed mount steel plate rotors. Dynamic mount rotors also assure full release from the pads to run true and drag free down the track. Clamping force is provided by radial mount DynaPro 4R four piston aluminum calipers weighing in at only 4.1 pounds each. DP4R calipers feature stainless steel pistons, internal bore seals, stainless steel bridge wear plates, and allow easy access to the pads for service without removing the calipers from the mount. BP-20 compound SmartPads provide high response and holding power when cold, and resistance to fade when hot. The complete package mounts to the OE spindle with full bolt-on installation. This kit is configured for drag racing only and is not recommended for street use. A minimum size 17” wheels are required along with a stainless steel braided flexline kit available separately. WIL-140-14103 2015-2019 Mustang® Wilwood Dynapro Front 12.88" Drag Racing Brake Kit with 4 Piston Aluminum Calipers Slotted .81" Rotor Min 17 Wheels Required, Wheel Diagram and Instructions This DynaPro4R Drag Race front brake kit is configured with GT48 directional vane Spec 37 alloy vented iron rotors for optimized thermal stability and durability on drag cars that will also see street use. DP4R race kits deliver high torque stopping power with a substantial weight savings over the OE brake components. These 12.88” x .81” rotors weigh only 10.2 pounds each. Lightweight forged aluminum hats provide additional weight savings to mount the rotors to the OE hubs. Clamping force is provided by radial mount DynaPro 4R four piston aluminum calipers weighing in at only 4.1 pounds each. DP4R calipers feature stainless steel pistons, internal bore seals, stainless steel bridge wear plates, and e-clip style pad retaining pins to allow quick and easy access to the pads without removing the calipers from the mount. BP-20 compound SmartPads provide high response and holding power when cold, and resistance to fade when hot. The complete package mounts to the OE spindle and hub with full bolt-on installation. A minimum size 17” wheels are required along with a stainless steel braided flexline kit available separately. WIL-RBK-2015A 2015-2019 Mustang® Wilwood Aero4 Rear 14" Big Brake Kit with 4 Piston Aluminum Calipers Min 18" Wheels Required Wheel Diagram and Instructions AERO4-MC4 Big Brake Rear Axle Kits replace the factory disc brakes and use the MC4 parking brake assembly as a compliment to front big brake upgrades on late model high performance vehicles. High capacity braking from the AERO4R calipers, BP-10 compound pads, and oversized 14.00" rotors are matched to the OE master cylinder output, ABS function, and individual vehicle bias requirements. Enhanced brake performance, increased durability, and high-tech style compliment big wheel, tire, and suspension upgrades on customized vehicles and all others with increased brake requirements. Brake line kit is included in this kit. WIL-140-14483-N 2015-2019 Mustang® Wilwood Road Race Forged Superlite 4R-QS Rear 14" Big Brake Kit with 4 Piston Aluminum Nickel Finish Calipers and Slotted Rotors Min 18" Wheels Required Wheel Diagram and Instructions Forged Narrow Superlite 4R-QS caliper rear road race kits provide matched performance in conjunction with FSL6R and W6AR front race kits on vehicles built specifically for competition. 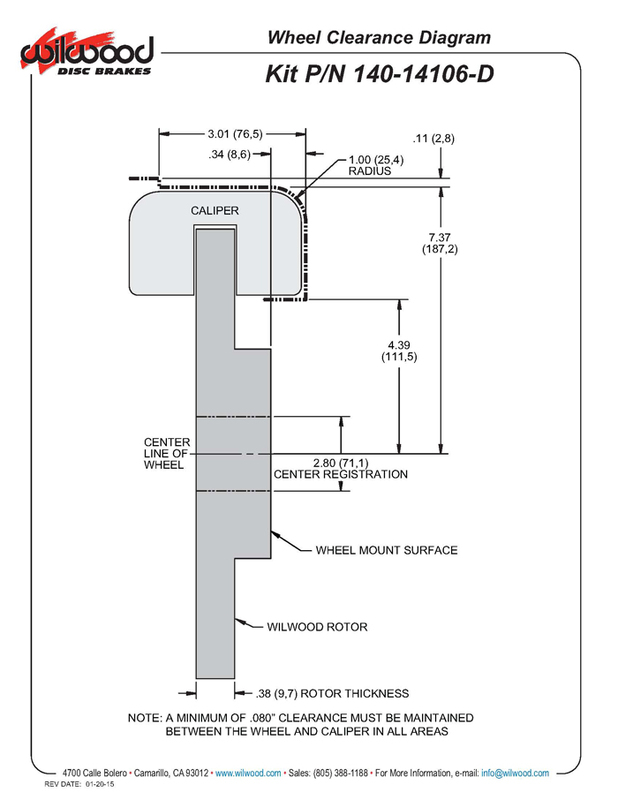 FNSL4R-QS calipers use high temperature, fluid resistant high gloss “Quick-Silver” finish, stainless steel pistons to retard heat transfer from the pads and high temperature seals for reliability in sustained high heat. Radial mount brackets attach the caliper in the stock location. 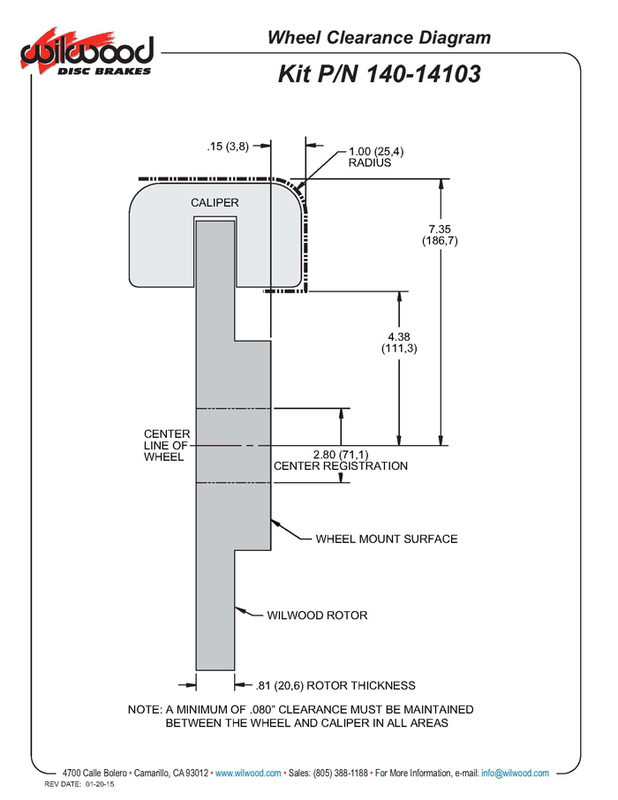 GT series directional vane competition rotors are dynamically mounted to forged aluminum hats. Kits also include high temperature, high friction race compound pads and all premium grade fasteners. WIL-140-14106-D 2015-2019 Mustang® Wilwood Dynapro Rear 12.9" Drag Racing Brake Kit with 4 Piston Aluminum Calipers Slotted and Drilled .35" Rotor Min 17 Wheels Required, Wheel Diagram and Instructions DynaPro4R Drag Race rear brake kits deliver high torque stopping power with a substantial weight savings over the OE brake components. Dynamic mount steel rotors weigh only 5.7 pounds each. They attach to the OE hubs with lightweight forged aluminum hats using our T-nut mounting system that allows the rotor to move independently of the hat during heat cycles. 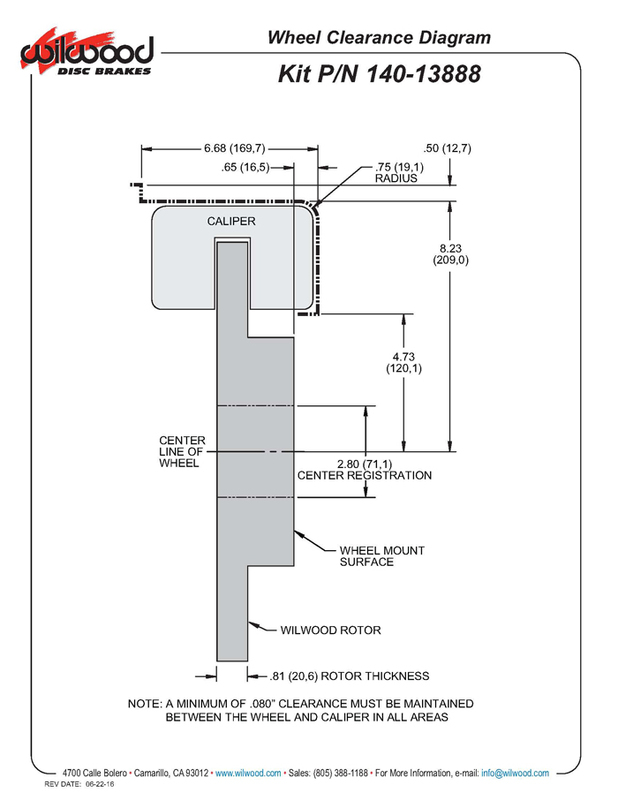 This eliminates stress at the mount points and the subsequent rotor distortion that can otherwise occur with fixed mount steel plate rotors. Dynamic mount rotors also assure full release from the pads to run true and drag free down the track. Parking brakes are also eliminated for additional weight savings. Clamping force is provided by radial mount DynaPro 4R four piston aluminum calipers weighing in at only 4.1 pounds each. DP4R calipers feature stainless steel pistons, internal bore seals, stainless steel bridge wear plates, and allow easy access to the pads for service without removing the calipers from the mount. BP-20 compound SmartPads provide high response and holding power when cold, and resistance to fade when hot. The complete package mounts to the OE upright and hub with full bolt-on installation. This kit is configured for drag racing only and is not recommended for street use. A minimum size 17” wheels are required along with a stainless steel braided flexline kit available separately.